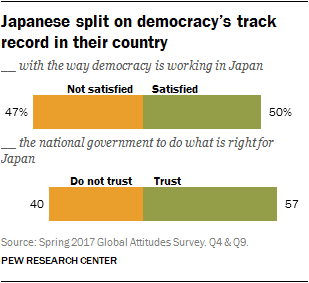 The Japanese public is largely divided over the quality of democracy at home: 50% say they are satisfied with the way democracy is working in their country, while 47% are dissatisfied, according to a new Pew Research Center survey of Japanese public opinion. Trust in government is more widespread – a 57% majority expresses confidence in the national government to act in the country’s best interests, but only 6% of Japanese have a lot of trust in the national leadership. 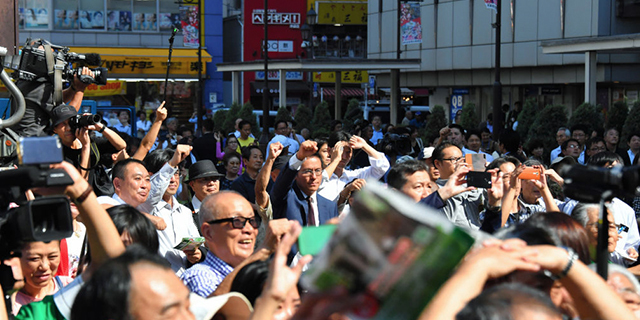 Despite these somewhat lukewarm assessments of their current political system, Japanese remain solidly supportive of democracy. 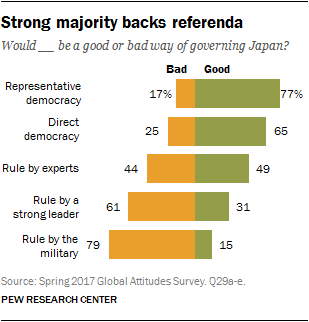 Roughly three-quarters (77%) endorse representative democracy, while almost two-thirds (65%) say referenda on major policy issues would be good for Japan – something that has never happened in post-World War II Japan. The public is generally divided over the wisdom of relying on experts to govern their country. Meanwhile, clear majorities reject the idea of turning to a strong leader or the military to govern Japan. These are some of the key findings from a Pew Research Center survey conducted among 1,009 adults in Japan, between March 8 and April 2, 2017. New doubts about the U.S. Along with a democratically elected government, another defining feature of Japan’s post-WWII existence has been its close relationship with the United States. 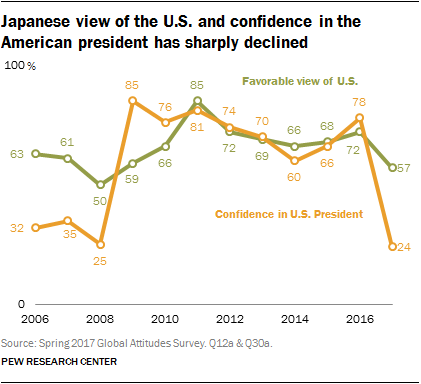 Japanese attitudes toward America have oscillated over the past decade, but in 2017 public opinion about both the U.S. and its newly elected president took a decidedly negative turn. Few Japanese trust U.S. President Donald Trump. Roughly a quarter (24%) express confidence in him to do the right thing in world affairs. Such faith is significantly below that in the Philippines (69%), somewhat lower than in Australia (29%), but higher than in South Korea (17%). Japanese confidence in Trump is 54 points lower than that expressed in 2016 for his predecessor Barack Obama. By comparison, trust in the current U.S. chief executive is down 71 points in South Korea, 55 points in Australia and 25 points in the Philippines. Reflecting their declining opinion of the U.S. and their lack of confidence in the new U.S. president, more than twice as many Japanese worry that the alliance between the two countries will deteriorate as believe the relationship will improve now that Trump is president. About four-in-ten Japanese (41%) think relations will get worse. Just 17% believe things will get better and 34% expect them to stay the same. Nearly twice as many Japanese ages 18 to 29 (25%) as Japanese ages 50 and older (13%) expect things will get better. And men (22%) are more likely than women (12%) to expect an improvement. Two-thirds of Japanese (67%) see global climate change as a major danger. About six-in-ten (62%) voice the view that the Islamic militant group known as ISIS is a major threat to Japan. But only 38% say a large number of refugees leaving countries such as Iraq and Syria pose a major peril. In 2016 Japan took in only 28 refugees from all countries. North Korea, which is rapidly building up a nuclear arsenal, poses an existential threat to many Japanese. Two-thirds (66%) are very concerned about Pyongyang having nuclear weapons, and this question was asked before North Korea tested a number of long-range missiles and nuclear weapons. This level of apprehension is comparable to that among Americans (65%) but higher than among South Koreans (59%). Roughly six-in-ten Japanese (61%) support increasing economic sanctions against North Korea to deal with Pyongyang’s nuclear program. Only 25% back deepening ties with North Korea. Notably, however, 41% of young Japanese support deepening ties, while only 21% of their elders, those ages 50 and older, agree. In their preferred approach to Pyongyang, the Japanese are again closely aligned with Americans, but their views differ from those of South Koreans, who are more supportive of closer ties with the North. Japan also has a troubled history with South Korea, having occupied the Korean Peninsula for much of the first half of the 20th century. 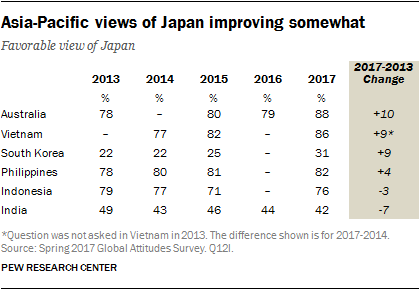 Just 26% of Japanese hold a favorable opinion of South Korea, comparable to recent public sentiment but down from 57% who held a positive view in 2008. Again, there is a generational divide in Japan about South Korea: 40% of young Japanese voice a favorable view, but only 18% of older Japanese agree. Japan’s relations with its neighbors are in part defined by how other nations see Japan. Among its Asian neighbors, Japan is generally popular, except in South Korea, where there are long-standing animosities, and in India, where many people do not have an opinion about Japan. Overwhelming majorities in Australia (88%), Vietnam (86%), the Philippines (82%) and Indonesia (76%) have a favorable opinion of Japan, including 47% of Vietnamese and 33% of Filipinos who hold a very favorable view. Since 2013 and 2014, Japan’s image has improved in both Australia and Vietnam, respectively. In contrast, just 31% of South Koreans see Japan favorably. Such sentiment has improved a bit since 2013, but is still below the 47% who expressed a positive opinion in 2008. One continuing source of tension between the two nations stems from World War II, when Japanese soldiers pressed Korean women into serving as “comfort women,” or prostitutes. In India, a nation with which Japan is trying to deepen economic and military ties, 42% voice a favorable opinion of Japan and only 15% have an unfavorable assessment, but 42% also express no view.